In the Ribbon, select the Home tab, then in the Styles section select Change Styles. 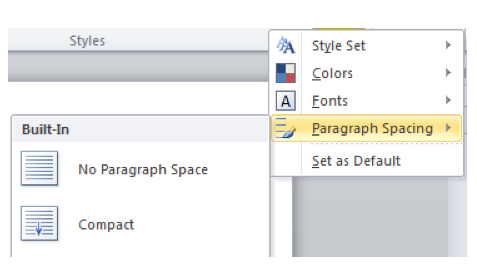 Select Paragraph Spacing and choose one of the built-in styles. 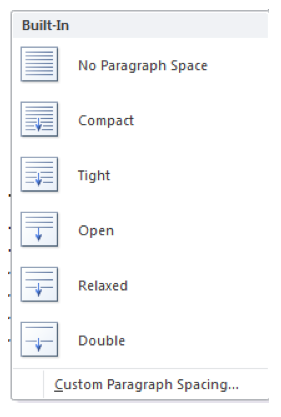 As you select each style set, you should see a real time preview in the document window (no spacing, compact, tight, relaxed, double, etc). 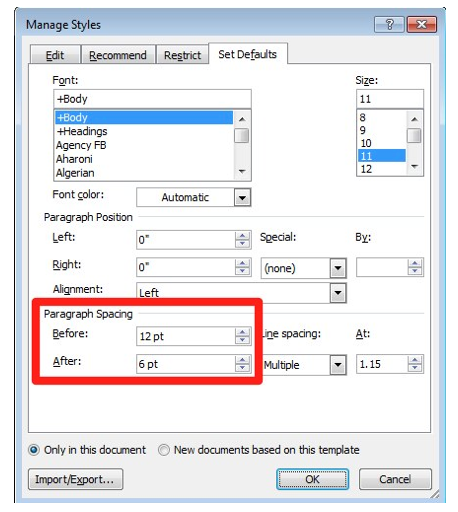 To customize the spacing, choose Custom Paragraph Spacing at the bottom of the list. In the Manage Styles window, enter the amount of desired white space in the Before and After fields found under Paragraph Spacing. After you add the white space you should notice more separation between your images and the surrounding text, as well as between your paragraphs. This can make the paragraphs stand out so that they are easier to read.